Donâ€™t let the walk up counter and ordering from the big menu up on the wall fool you. You should know that I am a big fan of Fish Taco’s, so ordering was easy. Made with Cod fish (grilled, blackened or fried), it was delicious â€“I opted for the coleslaw and RED ONION rings (which are a nice twist on the same old thing) as sides with the dish. I also ordered the Chicken Quesadilla which was stuffed with beans and cheese and served with a sauce they call” Bam Bam”!Â I chose the Chicken, but you could also have Shrimp. With this dish, I picked the salad and under the recommendation of our hostess Marissa, I added the Orange Basil dressing, which I wasnâ€™t sure how that was going to taste â€“ but my oh my it was yummmmmmmy! I am going to have to play around at home and figure out how to make that one!! Both dishes are priced under $10 and my friend and I walked away stuffed as the portions were plentiful! Prices ranged from moderate to high but there are enough choices to fit any one’s budget. At first glance, the decor may also fool you. The furniture was something you expect to find in your living room, chic…..with high tables and chairs. A big surprise from the outside look. 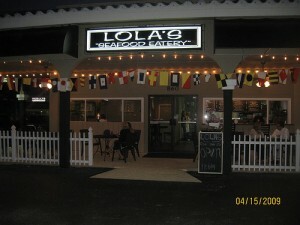 Whoever was responsible for the decorating, did a great job!Â Lola’s also offers outside dining under cover and shaded. 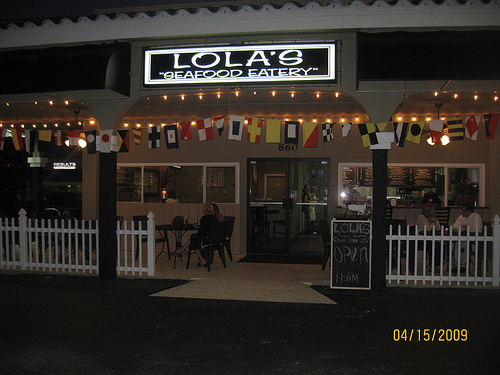 When things go wrong and you serve your customer some one else’s meal, what do you do? If you work at the Kona Beach Cafe, you apologize and make a gesture to show you care about your customers. What are the odds that two couples sitting at two separate tables would order practically the same items? Well not exactly the same but so close that our waitress could make the mistake of serving both couples the opposite orders. Arriving at Jensen Beach after a 17 hour drive, hungry and looking for a cold beer, we decided to try Kona.Â After scanning the menu and on the advice of our very pleasant waitress Chrissy, we decide to order the Pulled Pork sandwich and a Fish Taco dinner special. Upon arrival of our meal we notice that the fish in the taco isn’t fried but grilled and the plate is missing the dinner accompaniments as outlined in the menu. When we bring this to our waitress’s attention she quickly offers me a second beer on the house and returns to get my beans and rice and side salad that was supposed to be served with my meal. After many apologies and the explanation that we shared a similar order with the couple next to us, we all laughed. Even with the mix up, we still enjoyed our meal as it was delicious. Everything was bursting with freshness and flavor. The Pulled Pork , although tough to hold together inside the bun was very, very good. Every great Pork sandwich I have ever tasted ALWAYS finds its way out of the bun. The taco’s although grilled, which I like but prefer the fried fish for the crispness, was just as tasty. The crispy cabbage slawÂ and creamy sauce was just the right thing to top off the taco’s. Although no customer likes getting something he/she didn’t order, it is how the staff handles the problem that brings customers back. In this case, the owner of Kona should be very happy to know his staff was very professional in the way they helped to make our meal a great one. It is rare today to find good customer service, good food and fair prices in one place, so this was a pleasant surprise.